There are times when you want to celebrate the good times but you just don’t want to put a frock on! Jeans are always the best option I think for these kind of days but sometimes it’s hard to know what to wear on top. My ‘early’ birthday party brought me this dilemma, it was a casual lunchtime gig with family keeping it simple with food, wine and games – so being in your own home I just wanted to keep it light and casual – but not with my slippers on! For this, start with your favourite pair of jeans and then get your favourite pair of trainers or pumps out – once you know the colour-ways for them, you can start your search. All the tops I’m posting about you can get in other colours or styles – so just mix and match to give you the best vibe you want, and keep the jewellery minimal. 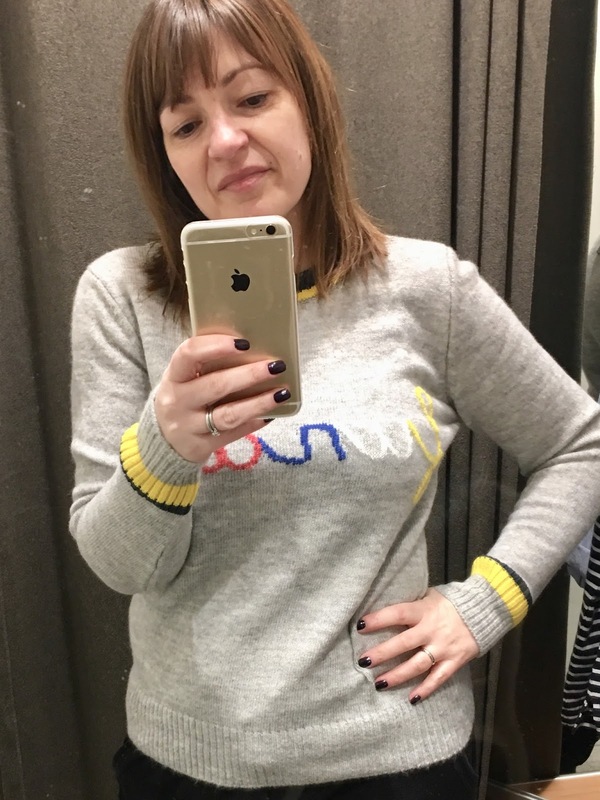 I chose my new jeans that I got in the sale from AllSaints and I teamed them with my Stan Smiths – I knew I wanted either a blue, grey or maybe a breton-stripe style of top, and with the current trend of stripes – I instantly loved this grey jumper from NEXT. 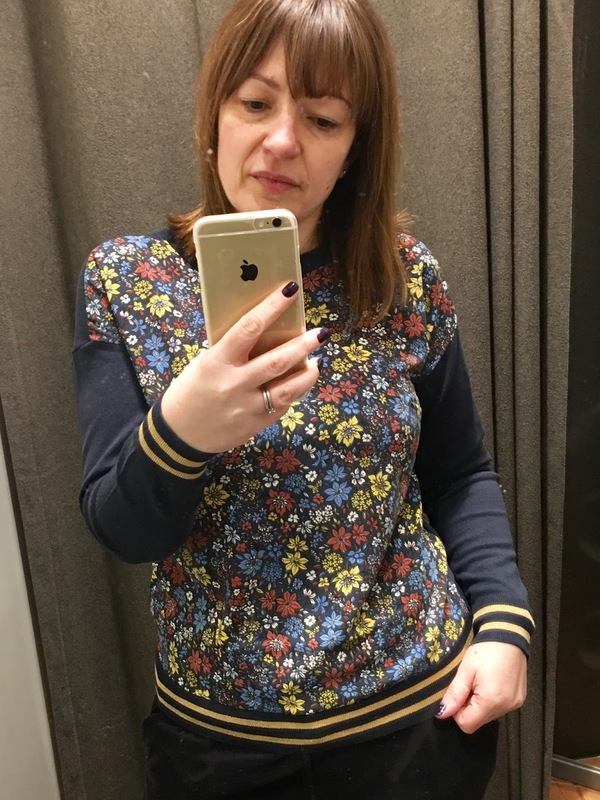 It’s a thin wool jumper that needs to be fitted and not oversized and for this I had to downsize two dress sizes, because I found it quite baggy around the stomach; there are no seams on the shoulder, it slopes with your own shape so it allows you to adjust sizing and still looks fitted. I’m really sorry but I could not find it on their website, I paid £20 – so head in store and it was displayed near their jeans section. It also, which sadly you can’t tell from my photos, has a glittery-silver neckline which just adds to the overall finish. 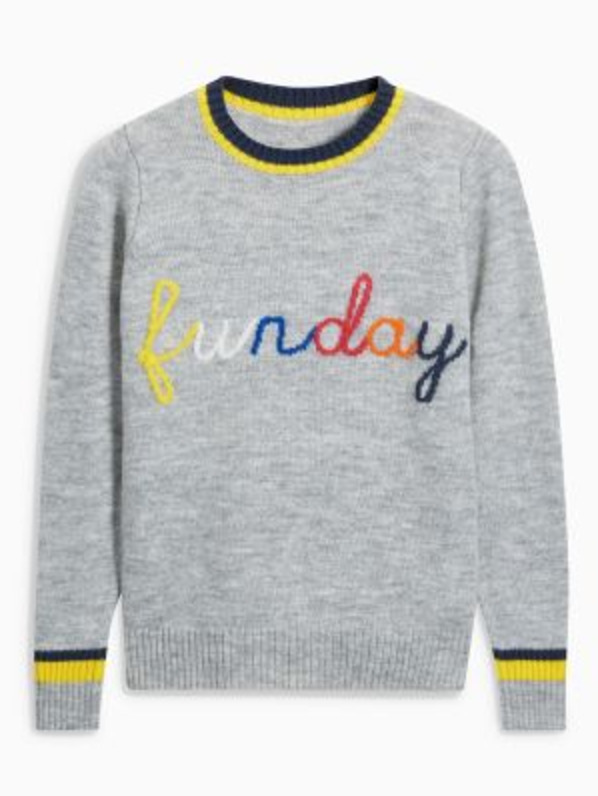 Sticking with NEXT, there is this Funday Jumper – I’ve seen this lots over Instagram, so it has been out a while, but there was plenty of sizes in store. I didn’t particularly want a winter jumper, but I thought this was lovely, and if I had someone with me whilst I shopped, I may have been talked into this, especially as it’s still cold outside! Size is true to fit. 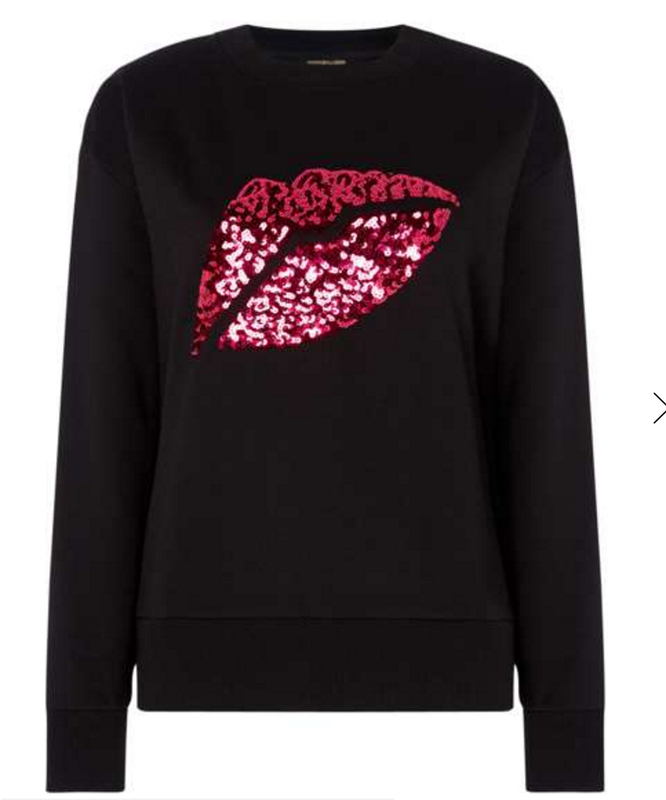 Now I was very tempted with this next sweater, particularly as I like to find any excuse to buy Biba, but I was a little put off by the black, I think it was too harsh a colour for what I was trying to achieve, and I couldn’t see any other colour options. 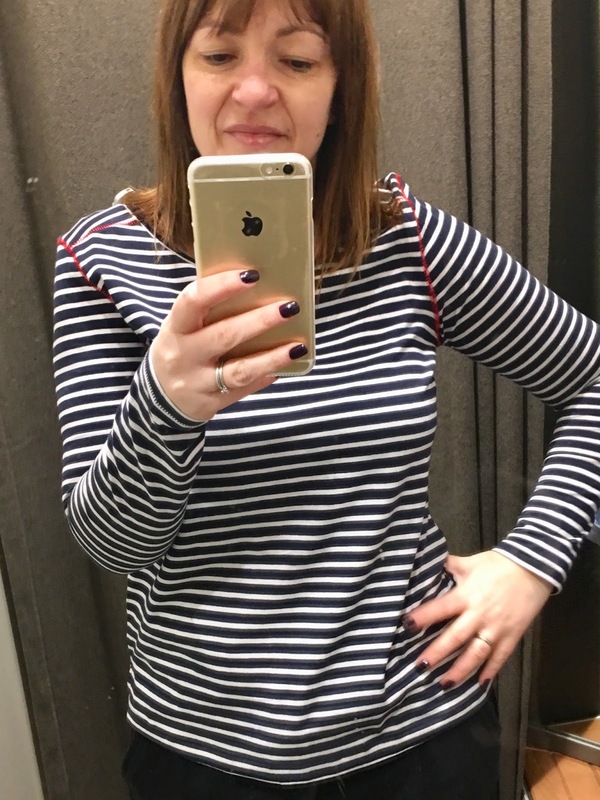 It’s meant to be oversized, I tried on my actual size and I loved it, but I’m afraid to say I just don’t think I would wear it – and for that reason it had to stay on the hanger! 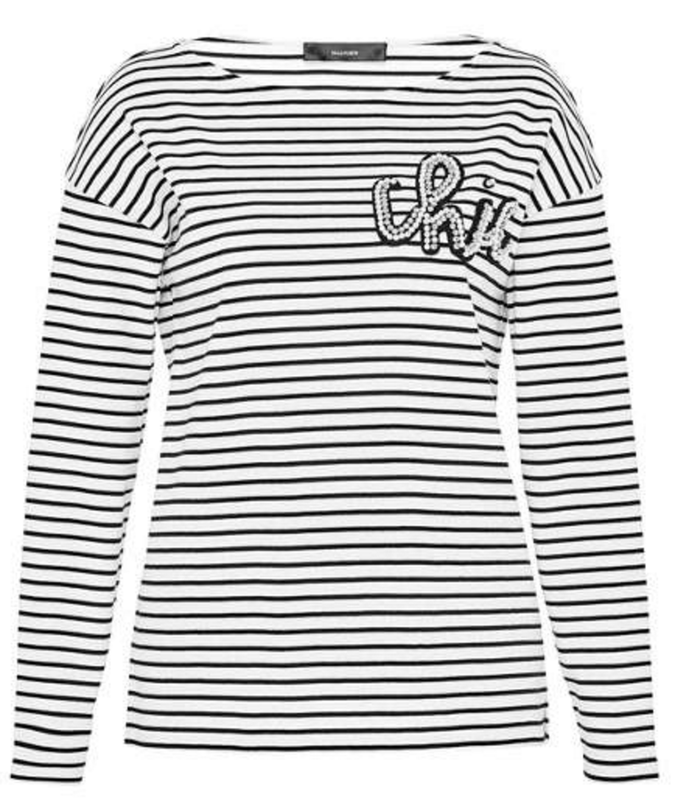 So then I tried the breton-stripe route – well this is the way Kate Middleton does causal – and it’s such a classic. 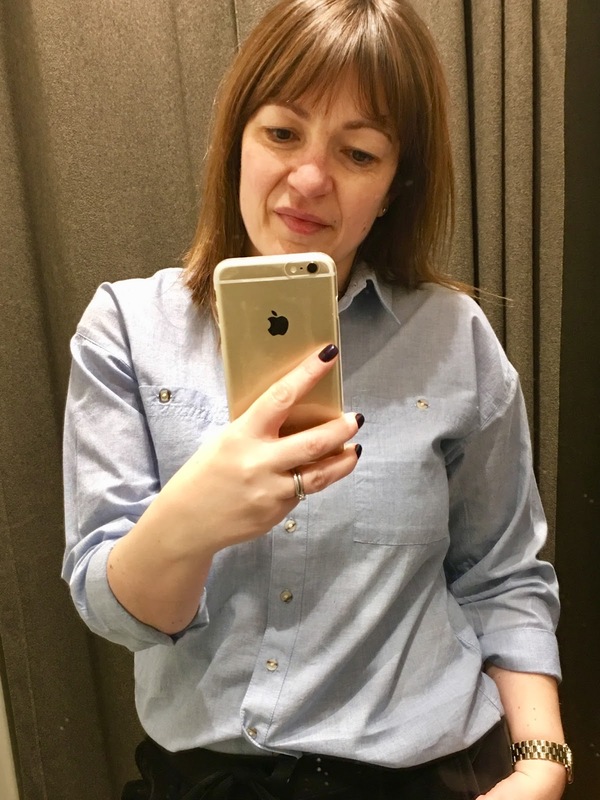 Hallhuber is a lovely brand and you can find it in House of Fraser – pricing varies some items seem good value for money and others I think are a little over-priced. 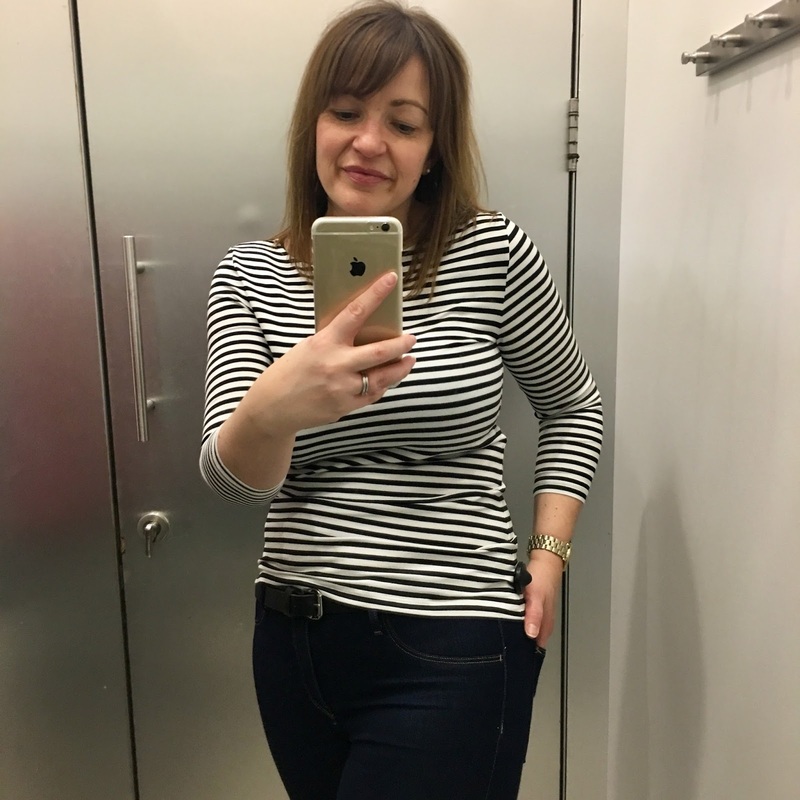 With this breton-stripe top, I thought the price was good and the quality was certainly there it does however cling to you, and so if you have lumps and bumps like I do, it wasn’t very flattering. I also didn’t want black and white stripes, this is where you have to stick to what you first had in mind. Now I couldn’t find the black & white version online, but they do have a pink one that you might like. This breton style top was from NEXT comes in other colours like green and coral, this will be great for Spring ahead, the size I thought was a little big, I definitely would have tried on a smaller size if I had been tempted to buy – as it came up particularly big across the stomach area, which is never flattering. 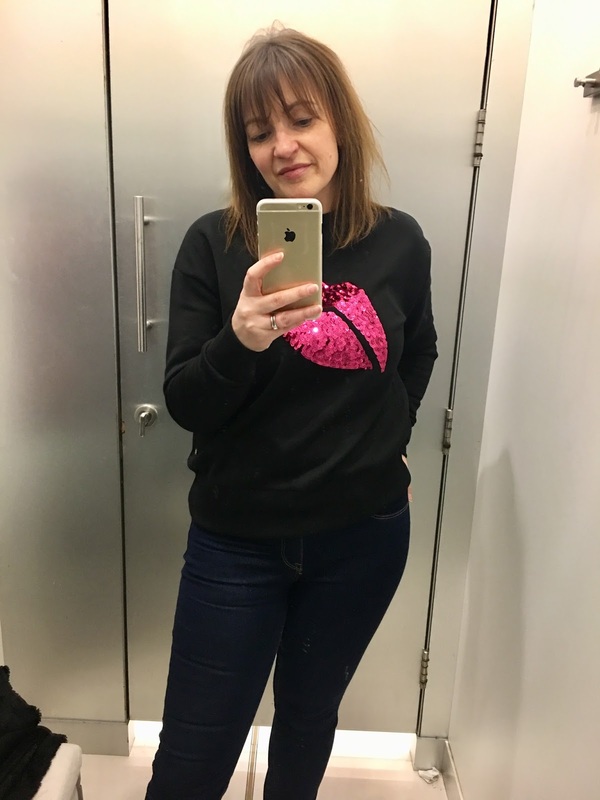 I also found this one in NEXT – I was drawn to it as there was something very Pretty Green about it; a mens brand designed by Liam Gallagher which have some very cool designs. I absolutely loved the gold strips around the waist band and the cuffs, the size is true to fit. 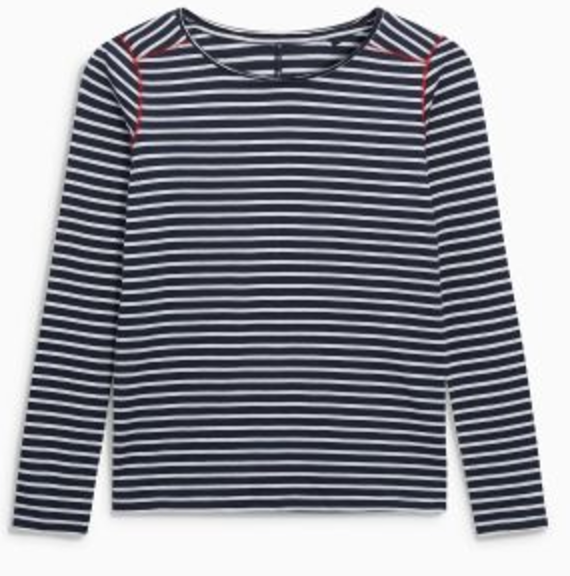 I think this is a truly lovely top – I just didn’t think it was quite me. I’m really sorry but it’s not showing on their website, it’s £28 – so head in store. And finally to end my story, this was the one that got away (well for now)! 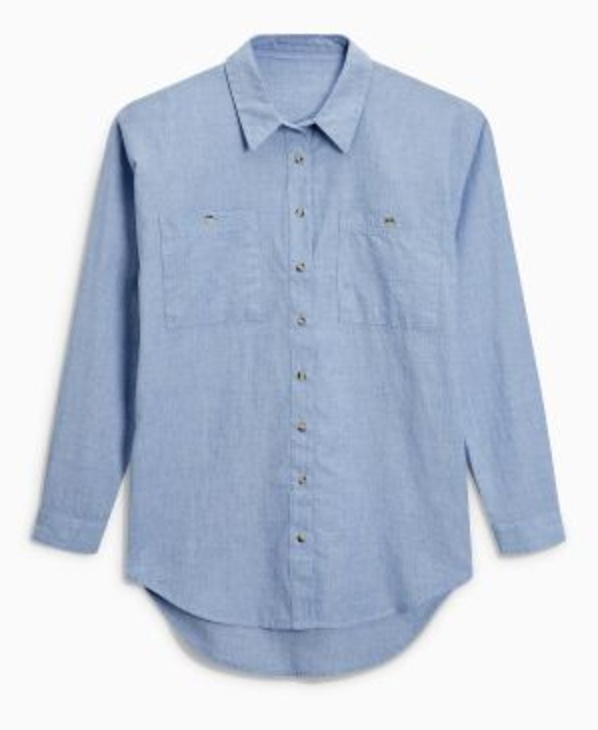 I’m keen on a blue linen shirt, especially for Spring/Summer coming up, this is a great way to be causal with jeans and trainers. If you don’t like light blue, opt for the classic bright white – but any other colour options could be a bit dated – for this season think cotton fresh!